This paper presents an image gradient based approach to perform 2D and 3D deformable model segmentation using level set. The 2D method uses an external force field that is based on magnetostatics and hypothesized magnetic in- teractions between the active contour and object boundaries. The major contribution of the method is that the interaction of its forces can greatly improve the active contour in capturing complex geometries and dealing with difficult initializations, weak edges and broken boundaries. This method is then generalized to 3D by reformulating its external force based on geometrical interactions between the relative geometries of the deformable model and the object boundary characterized by image gradient. 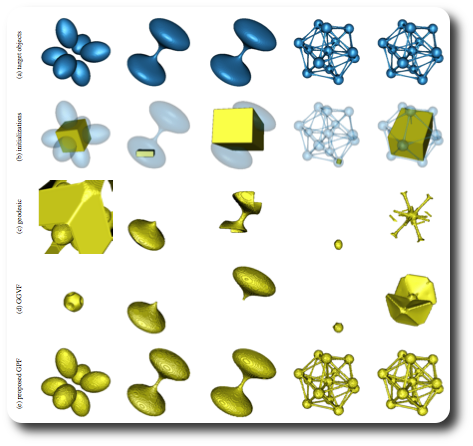 Xianghua Xie et al.,Image Gradient Based Level Set Methods in 2D and 3D, In Deformation Models, Edited by G. Hidalgo et al., Springer, September, 2012. This entry was posted in Publication and tagged Computer Vision, Medical Image Analysis on September 10, 2012 by Xianghua Xie.